Home > Love > Does Absence Make the Heart Grow Fonder? “Does absence make the heart grow fonder?” This is undoubtedly one of the most prominent, yet never answered questions circulating the relationship world. Some might say it’s a surefire way to rekindle a lost romance, while others admit it’s an easy way out of a relationship. So, what’s the truth? The real answer is this: it all depends on the situation. Absence is necessary in a relationship. I can’t be any more clear about this or stress it any further. Two individuals NEED time apart. They NEED personal space. Time to just sit back, relax, and focus on themselves for a bit of time. And that’s perfect okay, despite what some people may try to tell you. This is especially true in the beginning of a relationship, when everything is fresh and new. You want to spend ALL of your time together, learn everything about each other, and even after a 6 hour long night of just sitting and chatting with each other, you still don’t want to go to sleep. But what’s the problem with this? The relationship is being rushed. You’re not taking any time to enjoy the romance, and the spark is sure to die off. In fact, you may end up with one of those terrible relationships that just seem like they are suffocating you. Avoid this with a little bit of absence, even in the beginning. 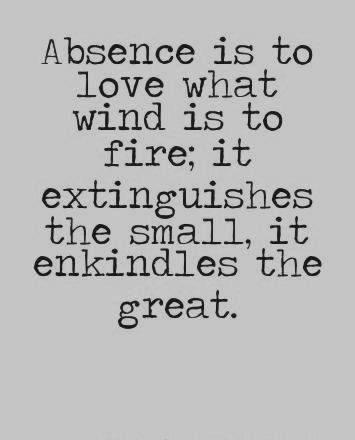 Absence is GOOD in a relationship. We know you don’t necessarily want to leave that special guy or gal, but just hear me out: you need alone time. Everybody does! Spending some time on yourself will allow you to refresh, recharge, feel more confident, and reflect on what you want to do in your life as well as your relationship. When you still make time for yourself, you will actually want your partner more. You will spend those days apart longing, wishing, hoping, and waiting impatiently to see your partner again, which will make the rekindling THAT much better! Too Much Absence is Not. This should be a no-brainer, but in case it’s not, then we’ll explain it anyways. Yes, we all need a certain amount of personal space. But when that personal time turns into weeks of less time together and even less time talking with one another, a problem arises. The other half will start to think they aren’t wanted or needed, and this may cause destruction in the relationship. Or even worse- it may cause a wandering eye that’s seeking out attention from somewhere else, also known as cheating. Not to mention if you’re not spending any time with your partner, you’re not growing with them- you’re only growing apart, which will obviously lead to a breakup. What About Taking a ‘Break’? When it comes to taking a ‘break’, here’s where things get tricky. Because the two of you aren’t necessarily in a relationship any longer, there’s no rules. You can date other people, and so can they. But does that mean you are going to? No. Does it mean they are going to? Maybe. Or does it simply mean that you need some personal time to focus on your career, only realizing night after night that they’re the only person on your mind before you go to sleep? That’s where the saying, “Absence makes the heart grow fonder, but it sure makes the rest of you lonely” by Charles M. Schulz comes into play. Yes, you will get lonely, and they may be exactly what you need to rekindle the romance. How Can You Avoid a ‘Break’? So taking a break sounds pretty awful, right? Unless you’re trying to completely break off the situation, and you have 0 intention of getting back with your partner, I highly recommend avoiding the treacherous ‘break’. A seemingly harmless ‘break’ almost ALWAYS turns into a full blown breakup. So how can we avoid this situation altogether? Ladies and gentlemen, I invite you to reread the first half of this blog. You know, the half that says ABSENCE IS GOOD. If you think you need a break from your other half, simply tell them you need a few days to relax and get your head in order. Don’t say it’s over. Don’t say that you want to take a break. Unless you’re done with the relationship entirely, simply tell them you need some time to yourself. They will certainly understand, and when the two of you get back together, nine times out of ten the relationship will be much stronger than before. …But What if it Isn’t? I knew that question is coming. So, what if you took some time off for a little bit, and when you went to dinner with your partner that night, everything was just as bad as the day you decided you needed a little time? At that point, it might be a clear sign that the relationship has completely lost its spark, and it may be time to pull the plug. Yes, it will hurt. But if the tried and true statement “Absence makes the heart grow fonder” did not prevail, then you should probably stop wasting time and energy on something that just won’t work. So, Does Absence Make the Heart Grow Fonder? Yes. If you are in love with this person or simply enjoy their company and want them around, the answer is yes. Absence WILL make the heart grow fonder. Always make sure you’re setting away time for yourself, and remember that spending time apart from your lover will actually make you want them more. Even though it sounds absolutely crazy, you’ll see better results this way. Don’t suffocate. Give the two of you plenty of time, and watch the romance spark. And if it doesn’t? Then it’s time to move on. So, what are your thoughts on this? Do you believe that absence makes the heart grow fonder? Do you think that it is different for every situation? Have you ever taken a break from a relationship and it not work out? Or did the break make everything better? Let us know below! We’d love to hear from you!